All the Seals of the Kingdom of the East. Bottom Left to Right: King's Seal, Queen's Seal, Great Seal of the Kingdom of the East (on top of King's and Queen's Seal), King's Chess Seal, College of Herald's Seal, Queen's Chess Seal, Original Seal of the Kingdom of the East. The Great seals of the Kingdom are used for certain armigious scrolls and for the sealing of charters and letters of marque. 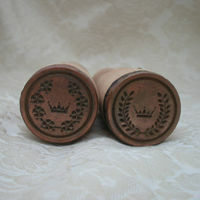 Wax seal impressions may be available to any scribe or herald of the East via emailed request to the Tyger Clerk of the Signet or Brigantia Principal Herald of the East (depending on which seal has been requested). There are only certain appropriate uses of the seals, which will be judged by the Royalty, Brigantia Herald, and Tyger Clerk of the Signet. As these seals have been passed down from reign to reign, so too have the stories behind their creation. Some are a bit newer than others, and there are others still that are deliberately ceremonial in nature due to either being unwieldy or otherwise in a fragile state. Thus to preserve these seals, only the Kingdom officers noted above (Tyger Clerk and Brigantia, and Crown) currently have access to these outside of the Kingdom Chamberlain's office. True to the historic model of a seal, the seals themselves may be used as a substitution for a royal signature, or to authenticate a document or award given by a person of some import (in this case, the King and Queen of the East, or the Brigantia Principal Herald for anything bearing the Brigantia Principal Herald's seal). Seals by commoners can be found across history for more than law clerks, city officials, and royalty; exemplars exist online of seals of office for farmers, executioners, and other sundry personae sending forth personal communication either in letters closed (sealed shut) or letters patent (in the historic sense, letters patent did not mean someone was being given a Peerage, but instead refers to a document that is sealed open, able to be read by all). There are currently seven seals within the East Kingdom, ranging in lightweight and as a simple matrix with no handle attached (Brigantia seal), to the heavy brass chesspiece seals noted above. Great Seal of the Kingdom of the East. Steel. This seal (pictured to the left) with the handle attached is an original, and has been passed down from Brigantia Herald to Brigantia Herald for many years, for safekeeping purposes. While it's true that there have been other seals over the years that have been unfortunately misplaced, this particular seal is an important part of Kingdom history, and the handle for this has been repaired at least once (the matrix is glued on). The seal matrix itself is lightly engraved in steel, and has seen many years of use, hence any application of it should be gentle or rare. 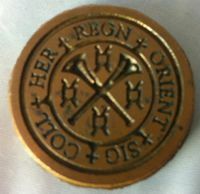 Inscription: "SEAL OF THE KINGDOM OF THE EAST"
Seal of the East Kingdom College of Heralds (Brigantia's Seal). Copper. The Office of the Brigantia Principal Herald (Brigantia Herald for short) has its own seal, which may be used to imply that the name and device upon a scroll has been registered with the Society College of Arms, as is the custom in many other Kingdoms, or it may be used to authenticate a direct communication from the Brigantia Herald (such as the conferral of a Herald Extraordinary ranking, which is a ranking within the College of Arms that only a current Kingdom Principal Herald or Laurel Sovereign of Arms may bestow. 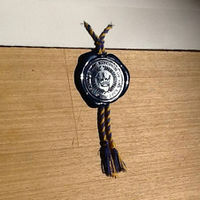 There are other ranks within the College and each has its own meaning, but the Herald Extraordinary rankings in particular have only recently come into fashion in the East as accompanying a scroll, and do not require the presence of Royalty to witness the bestowal of from the Brigantia Herald or Laurel Sovereign of Arms). It is known that at one point each of the original Kingdoms had a seal imprint registered with the Society College of Arms, however this practice seems to have ended sometime shortly after 2003, CE, according to the SCA Ordinary and Armorial webpages. 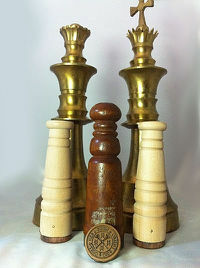 Inscription: "SIG COLL HER REGN ORIENT"
Seals of the King and Queen of the East, on Giant Chess Pieces. Brass. 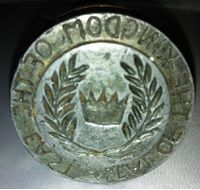 The chesspieces appear at first to be very over the top seals, however, upon asking around about these during her early years as Tyger Clerk, Kay Leigh Mac Whyte learned that these were not actually intended as more than a joke by a prior Crown of the East, who "wanted a pair of seals made that were list legal". The artisan met and exceeded this challenge in jest, although no documented use in combat of any sort (that we know of) has actually been mentioned. 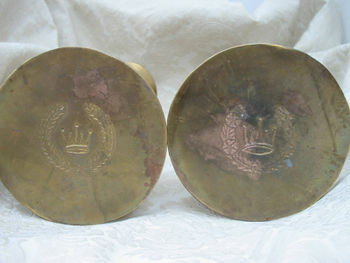 Some use of these seals for their intended purpose as seals is known of, as there is one of each of these impressions upon Baroness Jehannine de Flandres' Court Baroness scroll. Use of these seals upon scrolls is not recommended, due in large part to a very faint impression from the underside, and the large amounts of wax required to make a complete seal. (Depending upon the type of wax used, this can become very expensive, very quickly). Inscription: (Base, King) "REX EAST" and (Base, Queen) "REGINA EAST"
New Seals gifted to the Kingdom at the Coronation of Edward and Þora. Copper. Designed by Katarzyna Gwozdz and photoengraved by Master Iheronimus Brückner. 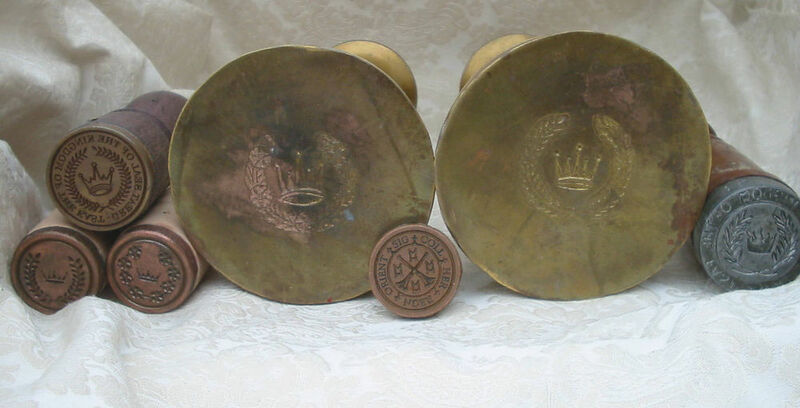 As noted in the caption to the left, these seals were originally gifted to Their Majesties Edward II and Thyra upon the occasion of their first Coronation together as King and Queen of the East in the Fall reign of 2012, CE. The handles are made of a lightweight wooden dowel, turned and sanded down, and you'll note the pins in these handles near where the matrix joins the handle - same as the pin or metal point on the "Ancient and Venerable" and "Great Seal" with handles. This bead or pin is actually a marker for the user, to show which direction is "up" on the seal impression, so as to not accidentally affix the seal upside-down on a page or pendant seal. Both of these seals are still in use to this day, and are part of a set specifically cared for by the Tyger Clerk of the Signet. New Seal gifted to the East Kingdom Signet Office at Birka, A.S. XLVIII, photoengraved by Master Iheronimus Brückner. This seal is by and far one of the most attractive (and hence, most requested for application) seals out of the set held in trust by the Tyger Clerk of the Signet. Originally there were others much like this one, which were unfortunately lost a very long time ago, and due to expense of making more, this seal is not purchased with Kingdom funds, but has been given directly to the East Kingdom Signet Office for use by its creator and owner. As such, only the Tyger Clerk holds this particular seal, but it is available for limited use (usually by the Tyger Clerk). 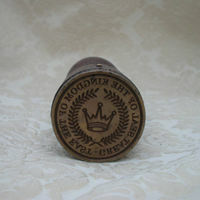 For individual scribes to use this particular seal themselves, a request for permission should be made well in advance of an event, as affixing a seal can take up to 30 minutes on average, and there may be multiple documents the Tyger Clerk will need to seal on site once signatures have been placed on the scrolls requesting or needing a seal. (Note: Requests to use the seal by anyone other than the Tyger Clerk may not be able to be guaranteed, especially if there are multiple scribes inquiring about use on the same day, or timing is just too tight for it). Alternatively, the Tyger Clerk may create wax "cookie" impressions of the seal for individual use by trusted scribes, or in the event that the window of placing a seal on the scroll on site is too tight on timing (such as for events where multiple courts or early morning courts are known to occur). Inscription: "GREAT SEAL OF THE KINGDOM OF THE EAST"
Pendant seal by Mistress Kay Leigh Mac Whyte. 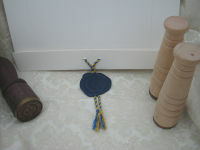 Seal tag wax is supple wax, and the cords are silk string fingerloop braided together. Pendant-style seals may be the preferred sealing style of the East Kingdom College of Scribes, but it is not the only type of seal style available. Previously in East Kingdom History (circa 1990's), the use of seals on scrolls was similar to the frequency and type used in many other Kingdoms of the Known World where seals are still very much in use to this day. That is, directly on the page (which can potentially lead to wax going places that you don't want it to go, or may not be appropriate to the time period of the style of calligraphy and illumination used). As an example of making sure the look "flows", you wouldn't match a Chinese "chop" seal with a late period English Grant of Arms or Indenture, but you may certainly see the chop on a piece of Chinese rice paper with Chinese calligraphy, and/or appropriately matched illumination. So it's important to make sure that even the type of seal matches to the overall style of what's going on the page for artwork and communication. Pendant seals are made by either using a strip of paper or vellum from the same material as the page being written on (think of diploma "ribbons"), or they can be made from fingerloop braided cords. If using cords, string made of silk or linen would have been appropriate to that time period, and we generally recommend making a little longer braided cord than you think you will really need. Cutting a pendant tag off the page and re-doing it, or peeling the wax while it's cooling off a cord, re-melting it, and reusing the wax to pour a new seal, is a much easier process than trying to scrape wax off a page without damaging the paper. Seals currently under the care of the East Kingdom Tyger Clerk of the Signet, and a sample blank document with pendant seal on a cord. Usually the seal is the very last part of the process, to make signatures go a little smoother for the Crown. Six of the Seven (yes, seven) Seals of the Kingdom of the East. Right to Left: Queen's Seal, Queen's Chess Seal, Seal of the Kingdom of the East, College of Heralds Seal, King's Chess Seal, King's Seal. 1. This looks awesome! How do I go about requesting a seal on any potential scroll I receive? You can ask the Tyger Clerk of the Signet (contact) to make a note of your request, which will be kept private, or you can entrust that request with a friend if you should happen to have an occasion where the seal would be appropriate (such as for an armigerous award, or other very special occasion award). Please note that as the seal is more frequently used, the matrix will be prone to wear and tear. As such, it would be appropriate to ask for a seal to be placed on a scroll for a writ, peerage, AoA, GoA, Court Barony, Cypher, or something equally notable. Please bear in mind, however, that most professional framers may charge additional fees to allow for "shadowboxing" (raising the height of the glass away from the matte so the wax does not touch the glass and is completely enclosed), non-standard framing sizes, or other methods that will keep both your scroll and the seal upon it intact. 2. What sort of wax is used? Should I worry about it melting? There are two different types of wax used; neither is what's referred to as "bank wax", which is a hard, breakable wax that at least one or two of the more western Kingdoms use. As with any sort of wax, we don't recommend leaving a sealed scroll in a hot car, or in a hot storage space, since the wax will do the same thing a crayon in the back seat of your car will do: melt and make a mess. Instead, the Signet Office has been using Cire Souple (supple wax), which can be found online for a moderate price for a pack of 4 3" sticks per package (each stick can make 1-2 seal impressions); or we may use what's referred to as "glue gun" wax. As the name suggests, this stick of wickless wax is placed into a device that looks like and acts like a glue gun, and requires a receptacle or mold to pour the hot wax into as it slowly melts off the point of the glue gun. The difference between the two types of waxes are that the product will either leave a crisp impression with a shiny surface (due to the resin in the supple wax), or it will still leave a good impression, but less the shiny imprint in the case of the glue gun wax. Bank wax, as referred to earlier, may be a bit closer to a period recipe, however at the average price of $16.00 per foot-long stick, we prefer to try to maintain a careful watch on our personal budgets. 3. Do our Baronies have Baronial Seals like the Kingdoms of the Known World do? Some of them do, yes. Settmour Swamp is one of these branches that has a seal inset with semiprecious stones, however it does not appear to have been used in some time. Seals at local levels may be appropriate for local branch awards, or tournament prize scrolls, or other sundry documents as communication provided by branch officers. As Shires do not give awards by SCA Law, I would still say there are workarounds, such as the aforementioned prize scrolls from events, should a local artisan be so willing to dive into this project. 4. Why do we have so many seals? Some of these seals were created with the intent to replace the "ancient and venerable", which has since been repaired at least once. Since then, we've been gifted with several others, sometimes because the newer versions of the seal were not known about by a well-meaning and thoughtful artisan. As the Kingdom seals are considered equal to a signature or authentication device, much like notarizing, copies of or additional Kingdom seal matrices would not be used at this point. This page was last edited on 1 February 2016, at 12:23.